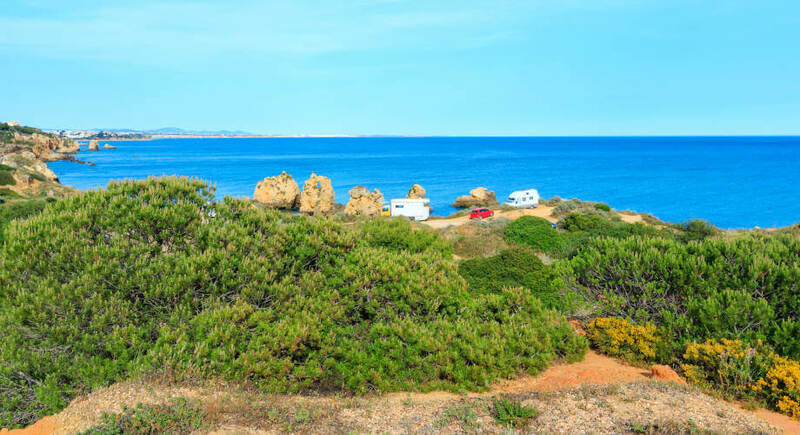 There are a number of fantastic campsites across the whole of the Algarve that are perfect for any camper. Whether you’re looking for a family-friendly holiday park, a smaller campsite or a more comfortable glamping option, you’ll find something that’s right for you. The Algarve is also an incredibly beautiful camping destination, so you’ll be able to enjoy stunning scenery no matter where you go. The Algarve is known for its fantastic weather, with over 300 days of sunshine per year. This makes it all the more ideal for camping although, of course, you will need to keep the time of year in mind. Naturally, the temperature is different throughout the year. During the summer, particularly in July and August, temperatures in the Algarve can often reach 40° Celsius and the area typically remains warmer in the evenings. There is also very little rain between April and October, meaning you can stay nice and dry. In winter, the evenings can often be much colder, with daytime temperatures typically reaching 20° Celsius. In the later months, particularly November and December, the temperature at night can often drop to 10° Celsius or below. Remember to keep all this in mind when planning your camping trip and what to take with you. As mentioned, there are loads of campsites across the Algarve that are very popular with campers and tourists. One example is the campsite in Ria Formosa, a stunning natural park of wonderful beauty. The campsite here is family-operated, with space for bungalows, mobile homes, tents and caravans, so you have plenty of choice. Ria Formosa also has free Wi-Fi, a swimming pool, a gym, a supermarket and more. Then there is Parque de Campismo Orbitur, a campsite on the western coast which is close to the beach. If you prefer glamping, there are quite a few options available such as Algarve Safari Lodge and The Walnut Tree Farm, both of which offer a pleasant rural retreat. In addition, there are a few naturist campsites in the Algarve. Wild camping, however, is illegal in Portugal in order to avoid the risk of fires during the dry summer months. There are a number of places to buy camping supplies across the Algarve. This includes larger supplies such as tents, which can be helpful if you don’t have enough space to bring one with you. Most of the larger campsites will also have a supermarket where you can stock up on food and other supplies needed for camping. If you’re looking to find out more about Faro and the Algarve before your holiday, you’re in the right place. We have a number of handy area guides to help you plan your holiday. Of course, we also have plenty of information on Faro Airport itself, helping you to find out all about the shops, services and facilities at the airport before you fly.